From left, Terrance Bostic, Shaun Carroll and Miesha McLeod sing karaoke at the Chattanooga Salvation Army on McCallie Avenue recently. The Salvation Army offers karaoke every Wednesday to give area homeless people something to look forward to. A sleeping woman embraced her belongings in a corner booth, seemingly deaf to her surroundings as fellow homeless Chattanoogans took their turns belting out karaoke songs at the Chattanooga Salvation Army on Wednesday. But she was the only one asleep -- the rest of Chattanooga's homeless karaoke lovers danced vigorously between the coffee tables at the small cafe. The faint smell of cheap shampoo and body odor filled the room. Standing out of the way of the dancers, Jessica Owens, a 52-year-old who has been homeless on and off for the past eight years, waited to take the stage. "I'm kind of shy but I used to sing when I was younger so this makes me feel good and brings back memories," Owens said. "[Karaoke] gives me some peace, kinda gives me a little excitement, since the majority of the time I'm by myself." When she took the stage, she sang Whitney Houston, her favorite artist. Despite the eruption of applause when she finished, she kept her eyes low and offered only a hidden a smile. Karaoke isn't a hot shower, isn't a free meal, isn't a bed to sleep in -- but it is a chance to feel human. 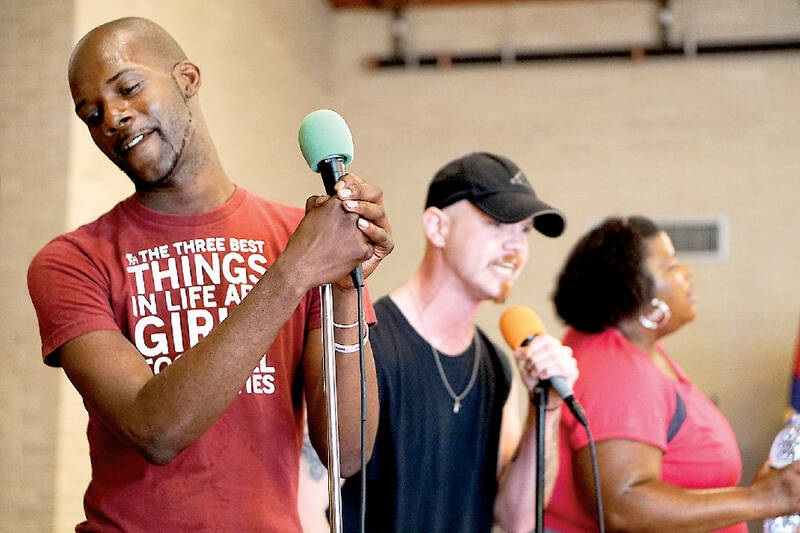 "Where else can homeless go to perform, be applauded and loved on in the Tennessee Valley?" asked Kimberly George, the director of marketing and development for the Salvation Army 614 Corps. The weekly event offers people who love karaoke an alternative to going to a bar to sing, and brings people into the building who may otherwise not request help. Sometimes karaoke can even change lives, said George. Since the karaoke events began three years ago, one man devoted his life to the seminary, and many others are now off the streets, some even returning to volunteer on a regular basis. George said she thinks karaoke day is unique to the Chattanooga location -- no other programs like it are anywhere in the United States. "It just touches my heart, seeing people trying to get off of the street," said volunteer Fred Holland. "If they have a bad day or sad day or something on their mind, it allows them to sing it out instead of going out and doing drugs or getting in trouble."